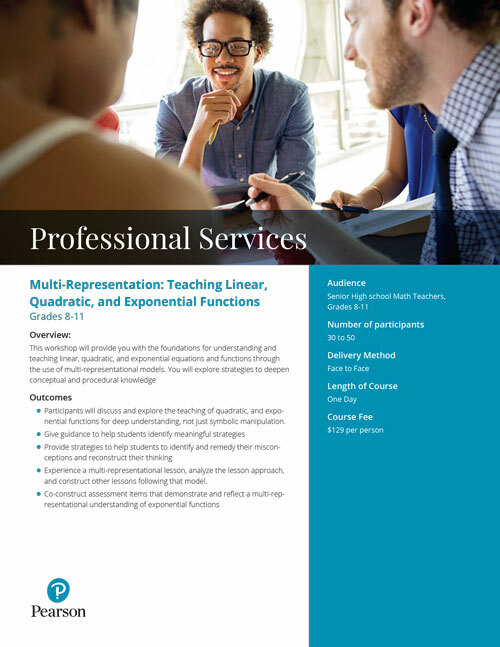 This workshop will provide you with the foundations for understanding and teaching linear, quadratic, and exponential equations and functions through the use of multi-representational models. You will explore strategies to deepen conceptual and procedural knowledge. Participants will discuss and explore the teaching of quadratic, and exponential functions for deep understanding, not just symbolic manipulation. Experience a multi-representational lesson, analyze the lesson approach, and construct other lessons following that model. Co-construct assessment items that demonstrate and reflect a multi-representational understanding of exponential functions.